Happy New Year from Friends of Vernon Park! 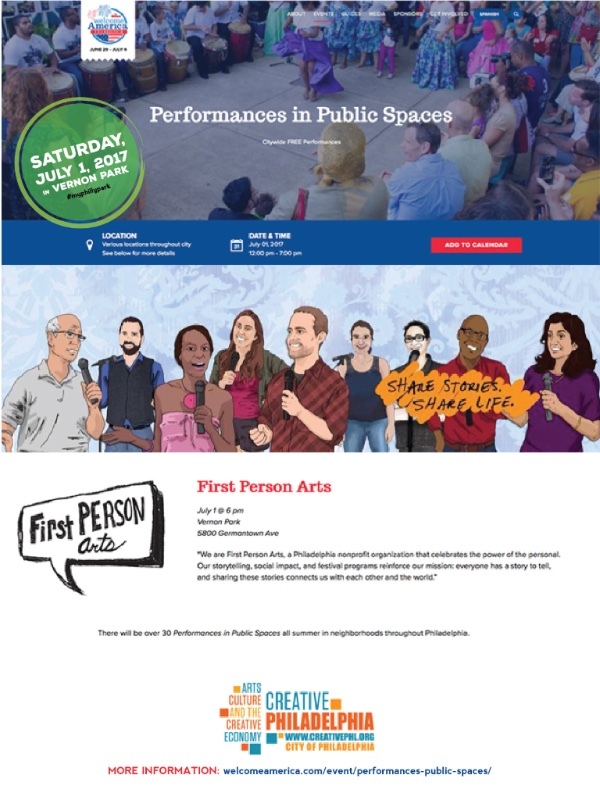 As we look forward to the year ahead with our wonderful community in Vernon Park and all around Germantown, we invite you to check out our FOVP_2017_AnnualReport_web. Thanks to everyone who joined us at an event, volunteered at a clean up, played on the playground and enjoyed the ‘Emerald of Germantown’, Vernon Park. See you in 2018! Join us for our 2017 Fall Bazaar on (new date) Saturday, October 21, 2017. Meet neighbors, learn about community organizations, enjoy great finds for great deals and the beauty of autumn in Vernon Park. A diverse array of over 75 vendors will be selling all kinds of treasures, providing vital community information and offering arts & advocacy based activities all in one spot—the “Emerald of Germantown”, Vernon Park! Please share with friends, neighbors, social media networks and local organizations—we truly appreciate your support for building strong community in our public spaces! Vendor registration is now closed. See you Saturday, October 21 in Vernon Park! Friends of Vernon Park is proud to share that Vernon Park will be the site for 2 installations by 2 exceptional artists, Karyn Olivier and Jamel Shabazz. 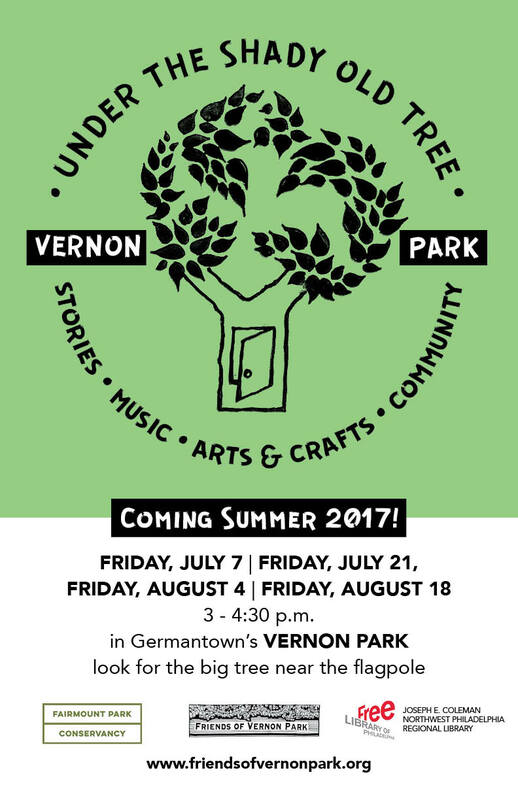 Kick off July right with these great happenings in Vernon Park! 9-10 am: Saturday Morning Yoga Series with Kate (all ages and levels) begins! 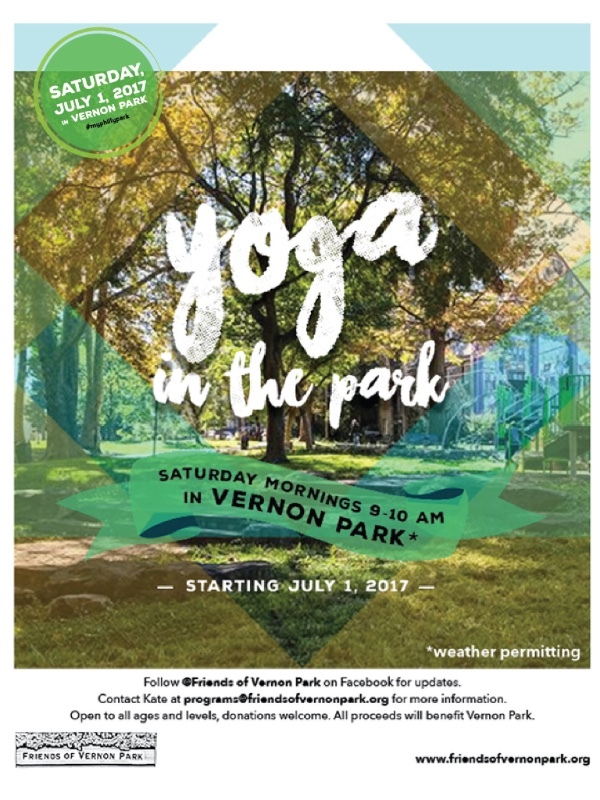 Donations welcomed and will benefit Vernon Park. Join us every Saturday (weather permitting) from 9-10 am in the Park. 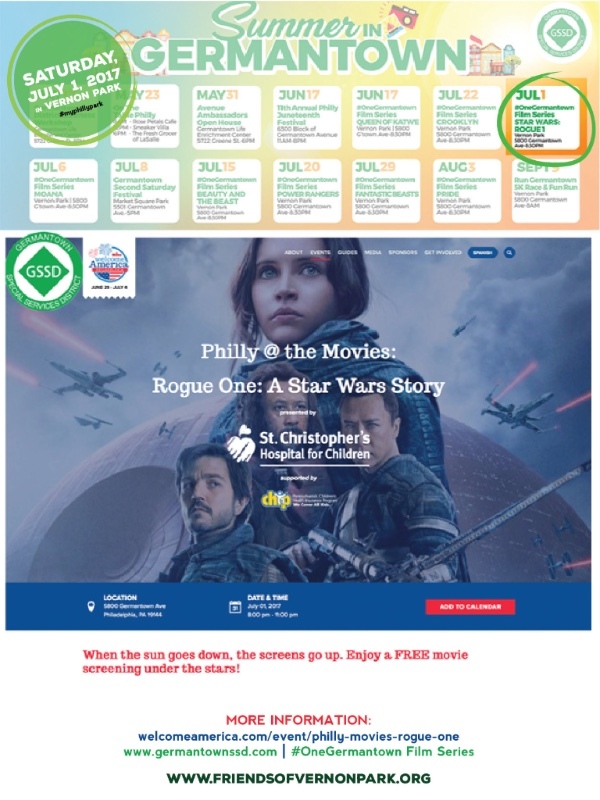 Starting at 8pm: The #One Germantown Film Series from Germantown Special Services District continues with partner Wawa Welcome Americato bring Rogue One: A Star Wars Story to Vernon Park. Bring your own chair or blanket and favorite snacks. All partners will be working together and with the 14th District to ensure a safe and enjoyable environment for all. Stay cool this Summer, with a book under the Shady Old Tree! Look for the big tree by the flagpole on the Greene St. side of the Park, we will be joined by Joseph E. Coleman Library’s Childrens Librarians, Artists, Musicians and more for storytelling, music, arts, crafts and and fun for kids of all ages. Made possible by a grant from the Fairmount Parks Conservancy. First story circle is Friday, July 7 from 3-4:30 p.m. Please spread the word! Update: 100 Vendors selling toys, bikes, clothing, crafts, tools, vintage and handmade wares; offering FREE arts + advocacy activities, community information and resources. Join us early in the day (9:15 a.m.) for a pop-up performance by the Youth Troupe of the Philadelphia School of Circus Arts to kick off the Bazaar! Spread the word and mark your calendar, this is going to be the best Bazaar + Flea Market yet. Friends of Vernon Park look forward to celebrating our community together! Announcing the world premiere of this wonderful documentary on Vernon Park made by Henry Farnham, Annie Xu and Tommy Victor during the Germantown Friends School Documentary Film J-Term class in 2017. So many great interviews + images in under 10 minutes. Join us for our Spring Bazaar on Saturday, May 6, 2017. Meet neighbors, learn about community organizations, find great treasures for great deals and enjoy the spring blooms in Vernon Park…and more. Please share with your friends and neighbors and come on out! Vendor Registration is now closed. Thank you so much for your response!